The busy month of October/November continues as Insite portable have not just recorded a high number of sales but have managed to secure a deal for a number of used buildings. We have over 60 jackleg portable buildings due in over the next month and a number of other cabins within the next 6-12 months. We have a selection of 12x9 toilets and shower units, 20x8 storage containers, 24x9 open plan jackleg buildings, drying rooms, canteen units. 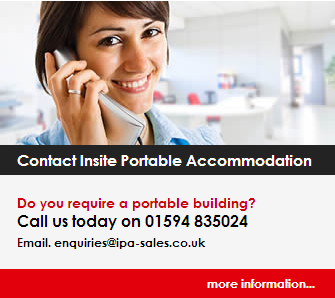 We have also a number of 30x9 and 32x10 portable buildings including double offices, shower units and canteen units. For all enquiries please contact 01594 835024.